We are renovating our school. We would like to make the classrooms more comfortable and learner oriented for the teachers and the children. In addition, we are also looking at making the staffroom more spacious and comfortable so that teachers can unwind, prepare, correct, and do all the countless things that teachers are forever busy with between classes. Would you have any suggestions? When you walk into many a school staffroom, you realize how little thought has gone into the making of a room that is constantly buzzing with productive activity in the form of discussions or debates about the assessments, a student’s progress, the annual day program or a lesson plan pertaining to a very challenging text, correction work, entering marks… the list is endless and none too trivial. Yet most staffrooms are small, even cramped, unimpressive and uninviting. A room that is meant to hold workbooks and notebooks of countless children, along with test papers and homework books, certainly doesn’t have enough cupboards or shelves to hold all these. If the school takes the responsibility of allocating cupboards and shelf space (based on the class, the subject and the number of students), then there are likely to be less tussles and therefore less unpleasantness. Teachers too must understand that the number of shelves or cupboards they each have access to does not determine power or status in the school. Young teachers who join the workforce have to be daring enough to wage a battle for a little bit of the privileged space either on the shelf or in the cupboard. So when designing your staff room, make sure that there is ample space for all the teachers in your school. If you think a single staffroom would be too noisy or too big, plan for two. The room should be airy, with at least two large windows, so that teachers do not literally toil and ‘sweat’ when there is a power shutdown. There must be more number of chairs than staff. The members of the staff do need to sit down and eat, and there must be space enough to accommodate a guest speaker or maybe an occasional helper for the sports day or the annual day program. Chairs must be comfortable. Teachers are on their feet for the greater part of the day, so give them the luxury of sitting in a comfortable chair and relaxing their tired feet and legs at least for a few minutes. 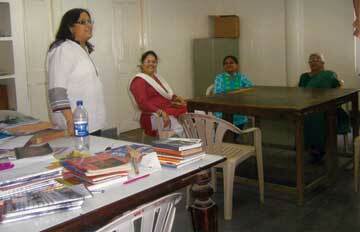 If the staffroom is not big enough to accommodate one big table, have several small tables in the room. Staffroom cupboards do need to be locked so that unauthorized people do not take away books or stationery. But in order to avoid the embarrassment or the pain of locating the figure of authority with the key, it would be so much simpler and practical to have duplicate keys made, or simpler still, have a combination lock (whose combination does not change whimsically!). Labelling cupboards and shelves would be so much more practical, both for teachers and the students who are sometimes requested to bring up notebooks or workbooks to class. There would be an organized air in the room and it would teach students so much about planning and methodology. There is also less whining about overbearing leaders and precious loss of time. Teachers need to think and plan, so make sure the walls are not drab, but are brightly painted. The staffroom should have a bulletin board, not just to pin up the time table of the respective teachers, but to put up motivational quotes that will drive and urge the teachers to hold high the torch of knowledge even on a day when there is a power shutdown! Teachers will also be able to put up interesting news on education and teaching methods from around the world as well as the latest fancies of the board of education. Since teachers have very little time to catch up on these issues at home, the bulletin board will serve to keep them up to date. Place a small table and a chair at one far corner of the room. This could be used as a place to hold a conversation with a troubled student, or even with a parent who has come for some kind of counselling. When not used for this particular purpose, the teacher who needs a little more quiet and peace to grade examination papers would certainly welcome the space. The teachers are the pillars of a school; they are the torchbearers for the next generation. Surely we can assure them quality time in between their rush to classes. But then, teachers too need to take the responsibility of making sure that the staffroom has a congenial atmosphere and there are no silly politics being played. The next time a child runs to the staffroom on an errand for the teacher, he should be struck by the meticulousness, the cleanliness and the animated environment of the staffroom; it should compel him to transform his own study room into an atmosphere conducive to learning. The author is a teacher educator and language trainer based in Chennai. She can be reached at manaswinisridhar@gmail.com.